Because of its unique characteristics as a highly sought-after precious metal with industrial applications, platinum is an ideal investment. Fortunately, you can invest in platinum in a number of ways. 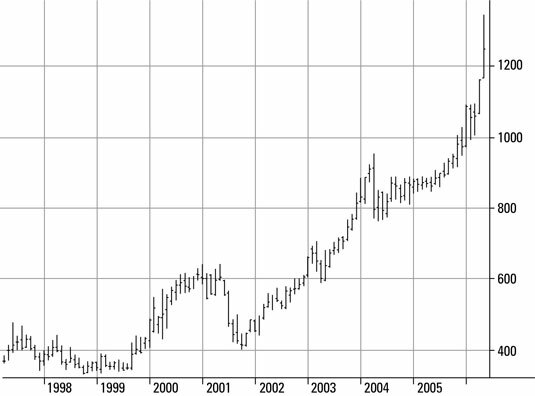 Historical price levels of platinum on the NYMEX from 1997 to 2006 (Dollars per Troy Ounce). The most direct way of investing in platinum is by going through the futures markets. The New York Mercantile Exchange (NYMEX) offers a platinum futures contract. Because of increased demand from the industrial sector and other fundamental supply and demand reasons, the price of the NYMEX platinum futures contract has experienced significant upward shift in recent years. The NYMEX platinum futures contract represents 50 Troy Ounces of platinum and is available for trading electronically. It trades under the ticker symbol PL. Stillwater Mining Company (NYSE: SWC): Stillwater Mining is headquartered in Billings, Montana, and owns the rights to the Stillwater mining complex in Montana, which contains one of the largest commercially viable platinum mines in North America. Anglo-American PLC (NASDAQ: AAUK): Anglo-American is a diversified mining company that has activities in gold, silver, platinum, and other precious metals. Anglo-American is a good choice because it has significant interests in South African platinum mines, the largest mines in the world. Investing in companies that mine precious metals, or any other commodity for that matter, does not provide you with direct exposure to the price fluctuations of that commodity. You need to be familiar with the fluctuations and patterns of the equity markets in order to be able to profit from this investment methodology. You also need to take into consideration any external factors that will impact the performance of the company, such as management effectiveness, total debt levels, areas of operation, and other metrics that are specific to companies. That said, investing in the equity markets still gives you access to the commodities markets.